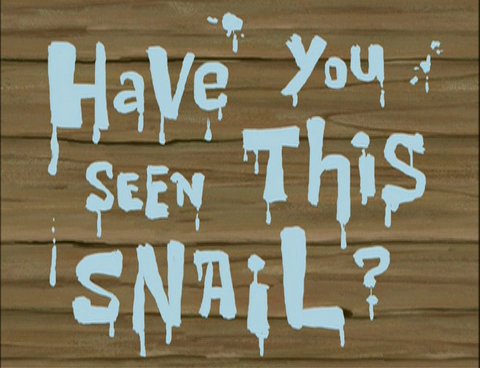 SpongeBuddy Mania - SpongeBob Transcripts - Have You Seen This Snail? Patrick: What are you doing? Spongebob: Carrying this heavy bag of snail food for Gary. Spongebob: He's fine. Uh, Pat, can we talk about this some other time? This snail food is really heavy. Patrick: Oh, sure, but there was something I wanted to tell you...something important. Oh, I remember. Uh... (Spongebob is gone) Who was I talking to? Spongebob: (paddleball hits him in the eye again) Darn it. Spongebob: So, let's get this straight, Gary. You don't want me to defeat the Dirty Bubble. You know, Dirty Bubble -- terror of the seven seas, arch nemesis of my favorite TV superheroes, Mermaidman and Barnacleboy, and apparently renowned paddleball champion. (Dirty Bubble on the box laughs) Well, I for one, recognize the importance of this undertaking. But whether or not you do remains to be seen. Now, if you don't mind, I would like to get back to it. (Gary slithers off) Pets -- sometimes I wonder if they understand a word you're saying. (Gary jumps on Spongebob's face, making him run around and scream) Gary, I hate it when you do that. Now get! (throws him away) And leave your master to his important affairs. (Gary rolls into his bowl and sees a crumb of food left. A bunch of spiders crawl out of it. Gary packs his things) Hey, I got one! Dirty Bubble, say your prayers. Patrick: (drinks his coffee then eats the cup) I haven't seen Spongebob in a couple days. I'm sure he'll be glad to know I remembered what I wanted to tell him. (knocks on the door then notices the bag of snail food on the ground) That's strange. Usually, I knock on the with this hand. (walks in) Hey, Spongebob, you around? Spongebob? Patrick: Spongebob, is that you? Spongebob: (muffled) Oh, darn it. Darn it. Spongebob: Darn it. Darn it. Patrick: Spongebob, what happened? (runs over to a picture of a krabby patty on the wall) This picture is crooked. Spongebob! Spongebob: (looks at the paddle) Darn it. Patrick: Snap out of it. Patrick: What is it, buddy? You can tell me. Spongebob I took the Dirty Bubble challenge. Spongebob: Why are you crying, Patrick? Patrick: Because... many years ago, I took that challenge. Patrick: I won. But then I lost the trophy they sent me. Spongebob: You lost the...? That's terrible! Come on, Pat. Let's have some kelp cookies and some sea horse milk -- that always cheers me up when I've lost something. There you are, Pat-- fresh sea horse milk. Spongebob: Hey, Pat, you ever feel like you're forgetting something? Something important? (trips over Gary's bowl) Hmmm. I think it has something to do with this bowl. Gary's food bowl. That's it -- I gotta feed Gary. (gets the bag of snail food outside) That's a lot of dust for a couple of hours. (brings it in and pours it in Gary's bowl) Gary! Dinner! (takes out a triangle) Come on, Gary, soup's on. Gary? Hey, Pat? Spongebob: How long was I taking the Dirty Bubble challenge? Spongebob: A week? Are you sure? Patrick: Hmmm... well... (pours the glass of milk upside down. It's solid milk) Yeah, it's about a week, maybe ten days. Spongebob: Ten days? Gary! (searches all over the house for Gary) Gary? Gary! Gary? Gary! Gary! Gary! Gary! Patrick! Spongebob: This never fails-- Gary's favorite treats. Gary can't resist these babies. They're filled with eight types of organic sediment that bottom feeders like Gary can't get enough of. Spongebob: Gary? Gary! Gary, where are you? Are you under here? (lifts a flower up) Gary! Keep shaking, Patrick. Spongebob: You check over there. I'll check in here. (checks in the bathtub Squidward is in) Find him yet, Pat? Patrick: (pulls the sink out from the wall, making water shoot out everywhere) No, but I'll keep looking. Spongebob: But there's nowhere left to look. Spongebob: I doubt Gary could fit in there. Patrick: Can't hurt to look. Spongebob: Here goes nothing. (opens the mailbox and a bunch of letters shoot out and a rolled up paper falls on the ground) Look, Pat! Spongebob: Let's see. "Dear Spongebob: These last few years have been some of the best of my life, but I must move on. Don't bother to come looking for me. By now, I have probably found a new owner who actually remembers to fill up my food bowl every now and again. Sincerely, Gary. At least until my new owner renames me." Dear Neptune, what I have done? Patrick: What do you mean? You drove him away. It's right there in black and white. See? Right there and there. Gramma: There you are. (grabs Gary) There you are, Miss Tuffsy. Oh, gramma finally found you. She was starting to get worried. Now let's get to your home, Miss Tuffsy, and get you something to eat. Hmmm. (shakes Gary) You feel much lighter than Gramma remembers. (cut to Gramma's house where she is feeding Gary cookies and putting an electric blanket over him) There you go, Miss Tuffsy. Gramma knows you like your Mr. Heaty set to extra cozy when you're home relaxing. Gramma: Goodness, you're almost out of cookies. Here, I'll go and get some more. Now, don't you go running off again. (Gary looks around the house at the beautiful things she has) There you go. After this, I'll go make up some of those deviled eggs I promised. (drops tray of cookies) Oh, how about a little music? Gramma's got a killer stereo system. (music warbling faster as Grammas cranks. Gary continues to eat cookies as jazz music begins to play) Oh, this song reminds Gramma or her days as a riveter. (dances) You make Gramma feel so young. Come on, Miss Tuffsy, let's do the boogie-woogie. (while doing the dance, she breaks her back) Oh. (set Gary back on the chair) Okay, oh, that's enough boogie-woogie for now. Gramma: Here's your room, Miss Tuffsy. Mr Krabs: Spongebob! You're 15 minutes late. Mr Krabs: Spongebob, are you okay? You look kinda...different. Mr Krabs: (snaps fingers) Aha! You just forgot to put your hat on. (puts his hat on his head) Knew I'd figure it out. (Spongebob's tears drop on the patty) Gary. Customer: Yeah, I'd like a refun for this Krabby Patty. Mr Krabs: Refund?! What's wrong with it? Mr Krabs: Spongebob! There's customers out there, boy, waiting to be fed! Spongebob: This wouldn't be the first time I disappointed someone who was hungry. Mr Krabs: Okay, boy, why don't you tell mr Krabs what's wrong. Mr Krabs: (grabs Spongebob's mouth) That's enough, boy. See it's not always what you say that matters. Sometimes it's what you don't say. Understand? Spongebob: Yes, Mr Krabs. I should've told Gary how important he was to me. Mr Krabs: Well, I don't know what that has to do with making Krabby Patties, but I do know this: any problem you have can be solved with a little hard work. Spongebob: You're right, Mr Krabs. Mr Krabs: That's me boy! Patrick: It's the apocalypse! Office products falling from the sky. Spongebob: No, Patrick. We're going to use this stuff to go find Gary. Patrick: But I thought you drove him away with your neglect and indifference. Gramma: (squeezing orange juice from the orange) There you go, Miss Tuffsy-- fresh squeezed. It takes longer to make it that way, but it was a labor of love. Spongebob: Here's a good spot. (puts a poster on the door) "Gary! I am sorry! Please come home! Love, Spongebob". Quick, hand me the tape. Patrick: Hey, their having a sale on scented pine cones. Patrick: Pine cones, pine cones, pine cones. Gramma: These pipe cleaners are simply delightful. Patrick: Old lady, quick. I'm looking for the scented pine cones. It's an emergency! Gramma: Well, I hope you weren't looking to buy them, sonny, because Gramma already picked up all they had. Gramma: (walks out) Come on, Miss Tuffsy, there's plenty more fun to be had. Lady Fish: Who is this 'Lisa' person? Gramma: Gramma will get a lovely meat loaf in the oven for you. Gramma: You don't want cookies? Don't fret, I made a batch of deviled eggs, too. (Gary looks behind him and Gramma is slowly walking behind him) Come back, Miss Tuffsy. You don't want these to go to waste, do you? They were a labor of love. (Gary hides behind some trashcans in the alleyway) Oh, don't worry, Miss Tuffsy, Gramma will find you. Snail #3: Hey! You're that guy who doesn't like nachos. Gramma: Oh, there you are, Miss Tuffsy. Patrick: Just let it out, buddy. That's right. Spongebob: I can't cry anymore, Patrick. When Gary left, he took all my tears with him. Patrick: Did you just say Gary? Spongebob, I just remembered earlier today at the craft store, I saw... these huge chunks of balsa wood! They were awesome! Spongebob: (sobs) Gary loves balsa wood! (runs out) I got to try to forget Gary. For some reason, I can't get him out of my mind. (look at the giant sign of Gary) I blew it-- I really blew it. I took you for granted, Gary. I'm sorry! Don't just start at me, say something! I'm talking to a billboard. Spongebob: Now I'm hearing things. If only I could see you one more time so I could tell you how much I love you. If only I could hear you meow one last time. Gary: (climbs on Spongebob's head) Meow. Spongebob: Yeah, like that. (Gary purrs) Gary, your purring is making it hard to forget you. Gary! Oh, Gary! So, did you hear any of that, or do I have to repeat myself? Spongebob: Okay, good. I promise, Gary, things are going to be different between you and I. You'll see, pal. Now let's go home and get you something to eat. You must be starving.